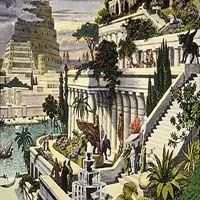 The Hanging Gardens of Babylon were one of the Seven Wonders of the Ancient World. These gardens were made by Neo-Babylonian king Nebuchadnezzar for his wife. The garden has exotic plants and animals which were imported from all over the world. Nebuchadnezzar ruled Babylon between 605 and 562 BC. These gardens were documented by ancient Greek and Romans writers. Based on descriptions of the gardens in ancient sources say the garden required a minimum amount of 8,200 gallons of water per day. It was destroyed by several earthquakes after the 2nd century BC. The city of Babylon is a subject of Bible Prophecy. Babylon is located about 50 miles to the south west of Baghdad in modern day Iraq. Alexander the Great and Saddam Hussein tried to rebuild the ancient city of Babylon but were both stopped in their tracks.